Today was only half rainy. Here is what I got (half) done. Took the front bumper off. I ended up finding a 1/2″ drive T-55 to do the lower bolts and then finished them with a 3/8″ drive. I’m gonna sand down the bumper and put a fresh coat of paint on it along with the tow hooks. I also need to clean up the frame ends and hopefully put some paint down on them. 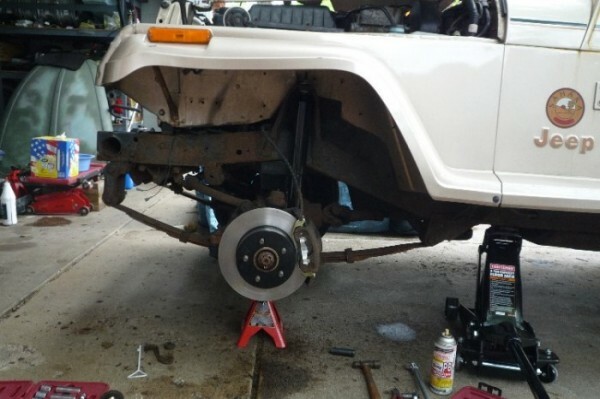 I lifted it up and took the driver side tire off and started to do some brake work. 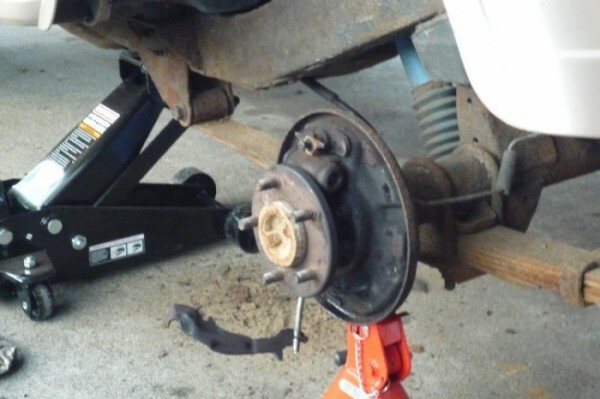 I installed new rotors and pads without much problem. I picked up really nice “Ultra Premium” rotors from Napa. They are by far my favorite rotors of all time. I’ve had them on the last 4 cars that I have owned. They are painted black with a machined rotor surface. And that paint lasts and lasts, they almost never get any kind of surface rust. Speaking of rust. Everything is really rusty. I look at my suspension and just think.. god. I want to replace that, that and that. I’ll have to start pricing everything out. But I really might replace my hubs, tie rods and the like. Maybe next time I have the wheel off I’ll look into it. I definitely need to wire wheel a bunch of the rust and get some paint on down there. I also installed a new Monroe Sensitrak strut and a rubber bump stop. The body is amazingly almost completely rust free. The frame however is not so lucky. The front and rear sections are common for rusting, and they did. The front was already repaired, and the rear will be done. I suspect the frame is probably 60% there.. there is a lot of surface rust. -Install Foglights on stock brackets (clean / paint brackets). -Install Rear Foglights and wire in switch. I should have front fenders, half doors and (now) a windshield frame on the way. I might pick up some paint to start laying down as a protectant. It really needs to stop raining for me to get some of these things done. The last few days have been weird weather wise. It has been so cold and rainy (even snowy) here in Minnesota. Combine that with me graduating from College on Friday and I just haven’t had much time to work on it. Cut to today where it was decently 50 degrees out and I had the day off from work. (These are actually the first photos I actually took with a camera). I ripped apart the rear end to do some axle seals and replace the parking brake cable. Also did some work to the front end. Removed the stock fog lights, and was attempting to remove the bumper to paint it. Looks like I need to take the shackles off to do that. Pretty nice since it only has 74,000 miles. Tomorrow I do it all over again. Pulling the driveshaft and draining the transfer case to install a rear output seal. Hopefully my doors get here soon as well. Starting about Wednesday I will be pulling the hardtop and interior and spending a few days Herculining the floor and sides. I found frame repair sections. There were some expensive ($250) sections that were boxed in, or some cheaper ($100) plates that you weld to existing metal. I opted for the cheaper ones as there is still plenty of metal to secure to. I haven’t driven the Jeep since the day I bought it (Thursday) because the battery went dead. I wasn’t happy with the battery connections (they were old and rigged in there) so I worked a bit today to replace them. In the process of doing that I had a rusted stud that refused to come out, so I had to cut a wire. I could have been driving the Jeep today if that had gone smoothly. -Rear Fog Lights (The amber driving lights). I went with the Pro Comp 100 4″x6″ amber fog light. I will be replacing the bulb with a lower wattage lamp and then wiring a flip switch to allow for switching between red and amber. -Front Fog Lights. One of mine was missing the lense / reflector assembly. Replacing this with a factory one would have cost quite a bit of money. I decided to go with the Delta 150 Foglight. It is a pretty close match for the factory light, just a little bit thicker I presume. -Fenders. I found a company that claims the fenders they sell are OE quality. If they are not, I will be returning them and attempting to get my money back. -Soft Top. I managed to find a Spice Bestop top here on Craigslist locally. It has quite a bit of hardware (2 of everything) and a decent top. I picked it up for $200 which is a great deal. -Half Doors. Saw some on eBay, probably will be out bid even though they are up to $400 right now. -Windshield Frame. I really don’t want to buy a aftermarket steel frame. I am trying to find a used rust free frame. Currently bidding on one, but its already up past where I really want to pay. I have a bit of maintainence to do. Hopefully I can get it all done tomorrow. 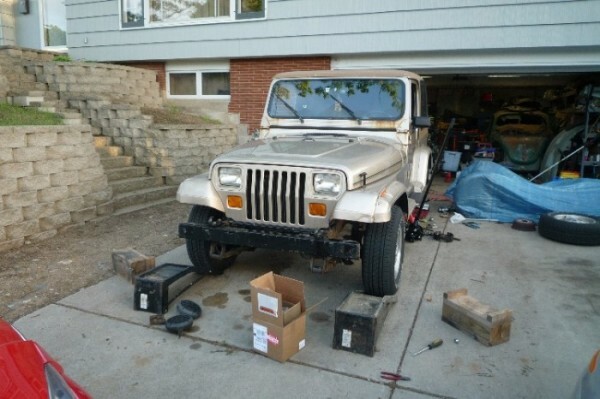 I have the battery, steering stabalizer strut, rear axle seals, TC output seal, and fluid changes for those. 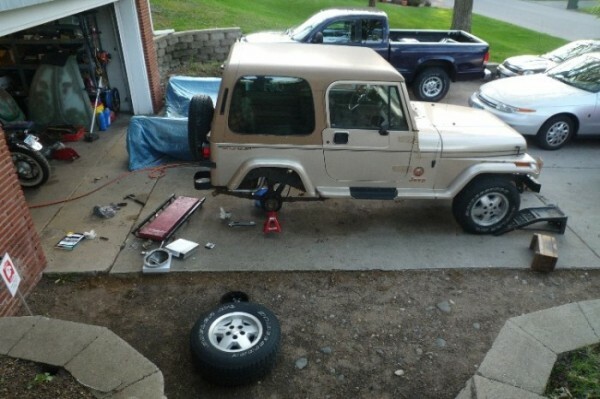 Now that I have a soft top, I want to pull off the Hardtop and install the soft top hardware. That will require a lot of cleaning and painting of the parts as some of them are rusty. I hope there is enough components to make atleast 1 good set of hardware. 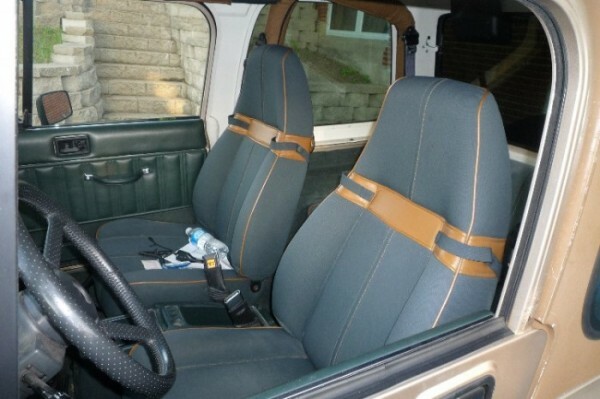 But before I put the soft top on, I want to pull the rollcage, seats and carpet and Herculine the floors and interior. I am pretty sure my floors are rust free (atleast no holes). So I want to keep it that way. I figure 3-4 coats of Herculiner should do the trick. After that is done the carpet will go back in. (I really like that look of that!). This is the start of my build. 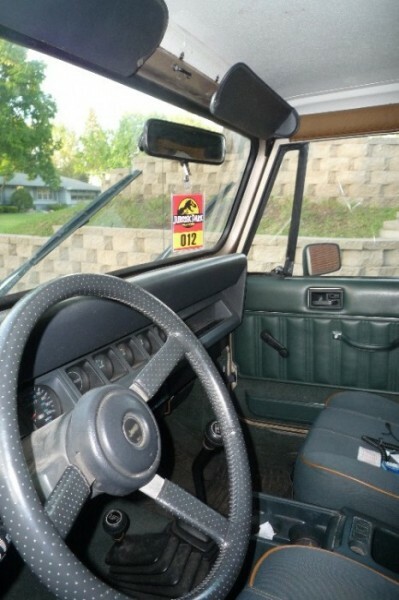 It is a 1993 Jeep Wrangler Sahara. 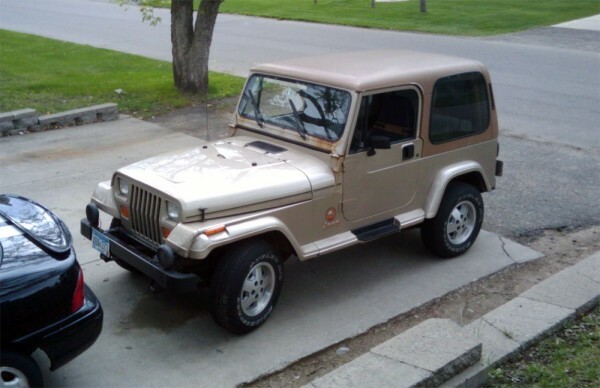 (The correct car is a 1992 Jeep Sahara, there is no difference between this car and the movie car). I purchased this car today for $4000. Its quite a bit of money but it is probably worth more. The previous owner had a lot of work done to it and provided me with receipts for thousands of dollars worth of work rannging from the clutch, to brake lines, and frame repair. It only has 73,000 miles on it. Came with full hard doors and a hard top. The first owner may still have the half doors and soft top. I hope I can get my hands on them. There is a bit of rust as you can see, but it is all quite basic. The worst is on the windshield frame and on the full doors. I will be cutting out metal when I can (or replacing parts). It will all be repaired right. After purchasing the Jeep I brought it over to my buddy at Tires Plus and we did an “Inspection”. Went under it and found some parts that need to be replaced such as the steering damper, sway bar links, transfer case seal and rear axle seal. 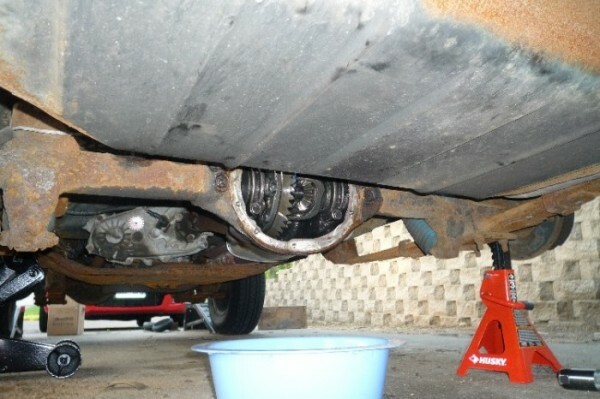 I wanted to take a look at the parking brake and find out why it wasn’t working properly. Turns out the parking break was SEIZED ON in the driver side drum. The brake was getting hot. We just cut the line and it released the brake. Problem solved. Noticed the frame has some rust where the rear leaf spring attaches. I hope that will be a easy fix. Do they have frame end kits I can buy to weld on? We checked the oil and it was rather low. So we also did an oil change. Now the car has a slight knock, but I think it will be ok.
After repaying my buddy at Tires Plus with food, we hung out in the parking lot and figured out how to disable the seat belt buzzer and get the lights to work. I guess we were at it for a little while the battery ended up dying and I had to push start it. Time for a new battery too! Overall, I am loving this thing.